Do you want your baby to have the finer things in life? Here’s some good news for our readers with babies. 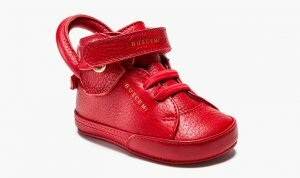 If you own a pair of Buscemi shoes yourself and like your kid to match your style, check out these charming mini baby Buscemi 100 mm sneakers. The popular Buscemi 100mm sneaker has been sized down to fit babies from 0-12 months old. Not only that, they have been sterilized too for your baby’s safety. Like all of Buscemi’s shoes, these baby versions are made of premium Italian leathers of very high quality. Similar to the original Buscemi 100mm shoes, these baby versions feature signature details like the Birkin bag strap at the back of the ankle and gold detailing. The only thing that’s missing is the lock and key. They are priced at R2000 each. I have white and red colors Buscemi baby shoes available now. Contact me now if interested in buying one for your baby.